I'm still catching my breath over here from the mass of DC Comics Fall 2014 trade solicitations that came out not too long ago, and in addition, I didn't see all that much to comment on in the DC Comics June 2014 trade paperback and collections solicitations -- a lot of stuff I'm interested in, but not so much to talk about. So we'll take this one a little quicker than normal, though I'm still curious to hear what made your buying list for June. This is a quick turnaround, hitting the solicitations just weeks after it was announced as part of DC's Fall 2014 lineup. To me what still puts this one over the top, aside from the great Legends of the Dark Knight specials, is the inclusion of Catwoman: When in Rome. Continues Jamie Delano's run on the "classic" Animal Man series with issues #51-63. Delano writes the title to issue #79, so they could maybe-kinda finish Delano's run with the next trade if they increased the issue count a little. Writer Jerry Prosser comes after, completing the series at issue #89. As you've no doubt heard by now, DC Comics announced plans to recall and reprint the Batman: Bruce Wayne: Murderer collection, which we all very much appreciate. It remains that the contents solicited for this Batman: Fugitive trade aren't correct, at the least because some of the issues solicited for this volume actually appear in the Murderer trade. I can understand that DC has to solicit their books far in advance of publication and so the solicitations may not always be accurate; I am surprised that once a book has been finalized, there's not at least a mechanism where they post the final contents on their website -- right now the website shows the same incorrect contents as the solicitation. Even so, DC has shown a dedication this week to getting their collections right, so I'm optimistic about the Fugitive trade. Sure it's interesting that this book collects Court of Owls with uninked, uncolored pencils by Greg Capullo, but what I think is even more notable here is that it's the entirety of the "Court of Owls" saga, the Batman Vol. 1 and Vol. 2 collections, in one volume. Those of you hoping for omnibus or Absolute editions of Scott Snyder's Batman work might take this first composite edition as a sign of what's to come. As a mostly Modern Age fan, my interest in these Batman and Joker anniversary books is in what modern issues we might find collected that haven't been collected before. In the Batman book, I notice Mike Barr's Detective #574, "My Beginning and Probable End"; also the book has one-off modern era issues by Chuck Dixon and Greg Rucka. The Joker book includes Detective #726, which was labeled as an "Aftershock" issue following Cataclysm. I actually thought this title had already been canceled, but new issues are solicited at least as far as June. I haven't heard great things about the book, but its longevity makes me wonder if I'm missing something. The Birds of Prey collection includes issues #18-24, 26, and Talon #9; that Birds of Prey #25 can be found in the upcoming DC Comics:Year Zero collection, and we can probably guess other trades will similarly skip collecting that tie-in issue. The Talon collection finishes off the Talon series with issues #8-17 and Birds of Prey #21, so the Birds of Prey and Talon collections each duplicate an issue from the other. I'm curious about the audience for this one, since the events of Brightest Day was one of the first victims of the New 52 relaunch. Did anyone miss Brightest Day the first time around and are picking up the omnibus now? I guess this'll probably work well, and fill in some gaps, next to the Green Lantern by Geoff Johns omnibuses when they get around to this point. Along with issues #20-25, this includes the Villains Month Reverse Flash issue. 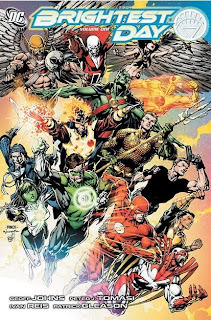 Appears that with this collection and the new creative team, Green Lantern Corps has switched to paperback, as has Green Lantern: New Guardians. Resolicited; this collection now includes issues #1-10, the complete series. I guess with the loss of the Green Team, Teen Trillionaires trade, we really can't be sure any trade is going to "make it," though my guess is that "Justice League" in the title will keep this collection safe enough. The Nightwing and Teen Titans books mark the second-to-last volumes for each of these series; presumably the next volume of Titans will collect seven issues, #24-30, and the Nightwing volume will collect six issues, #25-30. Includes Supergirl #21-26, the Action Comics/Cyborg Superman Villains Month issue, and also Superman #25, part of the "Return to Krypton" storyline (remains to be seen if this will be the whole issue or just the Supergirl parts). Solicitations say this collects Superman #18-24 and Superman Annual #2. I could've sworn Action Comics #24 was also part of this -- anyone know, and anyone know how it'll read without it? This volume, collecting issues #11-20, completes the collections of Brian Vaughan's Swamp Thing. OK, that's what I'm thinking about. What will you be ordering for the month? *That “Green Arrow by Kevin Smith” hardcover is going on my must-buy list. I’ve always regretted selling back my old “Quiver” trade during my move out of State College and it’s been nearly impossible to find ever since; the additional “Sounds of Violence” story is just a bonus for me. Kevin Smith has received a lot of flak for his work on “Batman” and “Spider-Man”, but his all-too-brief “Green Arrow” run was spectacular, plus it was illustrated by Phil Hester! *Also, I nearly let out a scream of joy when I saw the test art of Hulk fighting the Hulkbuster Armor on the recent Marvel Studios special on ABC. Not only will this be an amazing scene… but it also all but confirms that the rest of Kaminski and Hopgood’s “Iron Man” run will be collected, since they created it! This might be where those new “Epic Collections” come into play, with a big book collecting 292-318 with the exclusion of the “Hands of the Mandarin” tie-ins. *Marvel Famous Firsts Masterworks Slipcase Set—Okay, this is something I could see spending hundreds of dollars on versus those Adamantium sets. I personally won’t, mind you, but if you ever wanted to start a Marvel trade collection from scratch, this set would do it. *Marvel Masterworks Not Brand Echh Vol. 1 HC—I’m hoping they’ll turn this collection into some more affordable trades or Essentials. As cool as it is to see these collected, I’m not sure I could plunk down $70 for 60s and 70s humor that may fall flat. *Deadpool Minibus HC—This is a version of Deadpool that often leaves me cold, but I have to spotlight it just for the name. Kudos to the solicit writers for placing this directly after a bunch of omnibus listings. *Thanos: The Infinity Revelation OGN—Marvel’s OGN line-up has been scattershot, but giving Starlin an entire Thanos volume is a smart way to drum up interest. This is probably the most he’s drawn since “Death of the New Gods”. *Black Widow Vol. 1: The Finely Woven Thread TPB—I’m excited about this trade, both for the affordability and for Phil Noto’s artwork. It’s taken a while for a “Black Widow” title to really work, and Edmondson and Noto seem to have nailed it. *Deadpool Vol. 5: Wedding of Deadpool TPB—I’m surprised that this doesn’t collect the Infinite comic, since that has close ties to the wedding arc. This volume also includes the Annual, which does a neat job of explaining why the second voice in Wade’s head is gone (a move which I still applaud). *Fantastic Four Epic Collection: Into The Timestream TPB—This trade effectively replaces the first two “F4 Visionaries: Walt Simonson” trades and adds back the fill-in issues. It sadly ends one issue before the “New Fantastic Four” story begins, which makes me wonder if they’ll reissue that story in a new format, perhaps including “Spider-Man and the F4” #3 to pad it out. *Guardians of the Galaxy by DnA: The Complete Collection Vol. 1 TPB—Yep, saw this one coming from a mile away. The “War of Kings” trade getting reissued below it will help fill in some of the gaps too. The Deadpool Minubus is a must, but you really recommend Marvel Famous Firsts Masterworks Slipcase Set? I had my eyes on it, but found it too expensive. What makes it so good? I only recommend it in a "if you're going to splurge, splurge wisely" sense. Each collection contains about ten issues (except for the Hulk one), so you're getting far more value for $500 than the Wolverine Adamantium Collection, which only collects about 15-20 issues, offers for $200. Admittedly, most of these Masterwork books are available on the Kindle, so it's a prestige thing more than any practical library purpose. *The Ring of the Nibelung HC—Ooh, a way to read a Norse classic without having to deal with Wagner’s operas! Plus it’s by P. Craig Russell and Lovern Kindzierski, two very good creators, and it’s only $30. *GI Joe: Silent Interlude 30th Anniversary Edition HC—The GI Joe fanbase is freaking out right now, with the toys not appearing at New York Toy Fair, the comics in limbo and the third movie being shelved in favor of the “Jem” adaptation. A look back at the best GI Joe comic story of all time might generate some positive energy. I only hope it includes the “off-panel” issues Hama created for toy pack-ins a few years ago, which expand the story nicely. *Transformers: Dark Cybertron Vol. 2 TP—The finale ships this week, and I don’t know how they’re going to wrap it up with [REDACTED] getting killed and [REDACTED] joining the [REDACTED]. Personally I want to see if they’ll put out a cool hardcover version collecting the entire story. *GI Joe Origins Omnibus TP—I honestly have no idea which continuity family this falls into and whether it’s still canon. Larry Hama wrote it, which usually means it counts, and I’ve heard good things either way. *Godland: Celestial Edition HC—Well, I’ve read “Prophet” and “Manhattan Projects”, I might as well go check out the source of Image’s brand of craziness. *Manhattan Projects Vol. 1 TP—Speaking of which, I grabbed this when it was on sale at Comixology and found it to be an interesting experience. It’s certainly getting reviewed in the near future. *Archer and Armstrong Vol. 5: Mission Improbable TPB—This marks the point where I jumped on getting “A&A” monthly, and it’s been an amazing crossover with “Bloodshot”. It turns out that Christos Gage and Joshua Dysart can be just as funny as Fred Van Lente when they need to be. The zero issue collected here is also amazingly revelatory. Can you tell me which issues are included in the 75 years dounle? Can't find om amazon. Subject to change, but one source says: Batman book: Detective Comics #27, 83, 211, 216, 327, 359, 395, 442, 474, 574, 633, 711, 757, 821, Batman #1, 49, 181, 497, Batman #2 (New 52), World’s Finest Comics #94, DC Special Series #21, Batman Special #1; Joker book: Batman #1, 5, 25, 32, 85, 163, 251, 427, Batman #15 (New 52), Detective Comics #64, 168, 180, 475, 476, 726, 741, 826, Detective Comics #1 (New 52), World’s Finest Comics #61, Superman #9 , Batman: Legends of the Dark Knight #66. Dan DiDio just announced that Jeff Lemire, Terry, and Rachel Dodson will be putting out Teen Titans: Earth One sometime this fall. I love the idea of Lemire (a writer I really like, some of whom's best work is in the graphic novel format) plus the Dodsons' free to take on the Titans 100% free of continuity. Indeed. My list of "trade perspectives" columns to write is a mile long; will have a post on this sooner than later. They have to include the Action issue of the Psi-War cross-over. It's a direct continuation from where Superman #23 left off. It's the issue where Superman faces the real threat behind everything that has been going on, and it has a cliff-hanger that is picked up immediately in the next Superman issue. If they leave it out they're leaving out a major issue and it's not going to read good at all. I agree, but DC has done dumber things when it comes to collecting recent crossovers. Speaking of that, it seems there aren't any plans to collect the full Krypton Returns event in a single volume. Maybe the annual that kicks off the story will be collected in the next Action Comics volume, but it seems the remaining three chapters will be scattered among Superboy vol. 4, Supergirl vol. 4 and Superman vol. 5. I will be disappointed if that issue is left out. I liked the Psi-War event and owning a trade that is missing a key issue isn't something I want. I won't be too upset if there is no Krypton Returns trade. It was a pretty bad event and needs to be forgotten as soon as possible. Not only I think Action Comics #24 belongs in Superman vol. 4, but I also think Action Comics vol. 4 should skip it. Issues #19-23 all include back-ups, so they're more than enough to fill a collection. In addition to the whole 4-part crossover, it will include the H'el one-shot (an essential prelude, since it reveals his true origin) and the #0 issues of Superman, Supergirl and Superboy. That's good news for readers who passed on Superman vol. 3 in favor of the Superman: H'el on Earth collection, which didn't include any of the #0 issues. Animal Man V6 Delano & Pugh's run! Batman/Bruce Wayne Fugitive, Nightwing, Brian K. Vaughan's Swamp Thing (tragically underrated).I'm curious whats in the Batman & Joker 75 years books. I'm glad that Scott Lobdell's Teen Titans has been put out of its misery! I'm done w/ the Green Lantern books,Johns & Tomasi's leaving left those books in the hands of writers that obviously don't understand the characters at all. Larfleeze is the only Lantern book I will now run & unfortunately thats ending w/ 12. Can't forget Smith & Hester's Green Arrow, great wrting gorgeous art!